It's official. With young Princess Snow disqualifying for the position last week,* Henry of Once Upon A Time has become the Mary Sue-iest of Mary Sues on television today. So, what does it mean that the poster child for Mary Sues everywhere is actually a boy? *We finally saw Snow lose her goody two shoes when she told off her maid** for trying on her tiara. **Poor Johanna/Mrs. Patmore. Always the maid, never the mistress, amirite? First, let's review for the uninitiated. A Mary Sue is an archetype most often associated female fan fiction characters. The person is dearly beloved by others in the story, possesses few faults if any, is more true of heart than their contemporaries, and often plays a significant role in solving the problem at hand. TL;DR: Mary Sues are perfect and they're boring as crap. This is Once Upon A Time's Henry to a to a tee. The kid can do no wrong. The show began with Henry's quest to find his mother breaking the evil queen's spell over the townsfolk. Acting as their moral compass, the child's weekly cries for people to do the right thing constantly reign in the potentially harmful behavior of the adults around him. For crying out loud, the lead characters' main motivations often revolve around protecting his safety or securing his love. 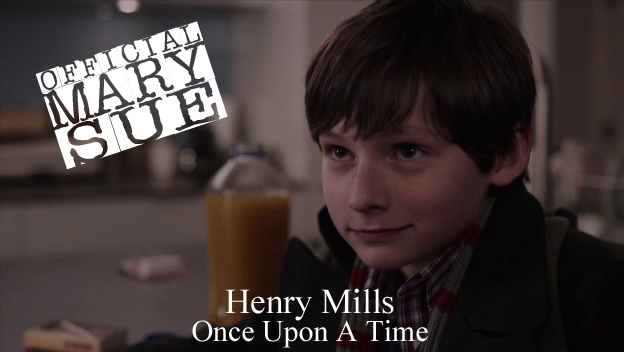 I can't think of a single character on television more perfect than Henry Mills. You said it, Judge Judy. Henry kinda makes me wanna barf. The Mary Sue-iest character on TV is a boy. What does this mean? Is obnoxious Henry a small victory for feminism or is it merely a sign of poor writing? There's no question this is a prime example of shoddy writing. Henry has become a dreadful little conscience for the group. The kid is more opinionated than Dr. Hopper has ever been and that's the cricket's freaking job! The real conundrums are: does having a male play the role of the universally despised archetype make any impact on how we perceive females in the same position, and is this golden boy more acceptable because he's got XY chromosomes going on? What do you think? Weigh in in the comments below. I think if Henry was Henrietta she would be just as annoying. Since the three main characters (Snow, Emma, and Regina) are all women, that might be a reason why they made Emma's child a boy. Let's not forget Wesley Crusher, God King of the Mary Sues, who was universally reviled. Created by Gene WESLEY Roddenberry, he was the smartest person on the ship, always had the right answer, canonically destined to become a god, and when he screwed up it resolved with the creation of new life and laughs all around. I don't think Wes had much of an impact on how Mary Stews of any gender are viewed either, so odds are this poor soul won't have any impact either. Oh, how could I have forgotten about Wes? I HATED him when I was a little kid. He was so smarmy. Male Sues are actually a pretty old concept, though they've sometimes been called Gary Stus instead. Granted, the name *is* feminine and the stereotype is female as well (perhaps because fan writers are disproportionately female) but male Sues definitely exist as well. But it would probably be accurate to say they aren't called out as much. As for whether there's any kind of feminism to be seen here... eh, no. Bringing male characters down to the level of treatment female characters often receive isn't really feminism, it's just bad writing that may create a false sense of equality. I think that's the real problem. The stereotype revolves around females: female characters and female writers. Yet, as Dunny points out, some of the most well known Mary Sue characters with male creators. Why do we still see it generally as a fault with female writers and fail to recognize as it equal opportunity problem?